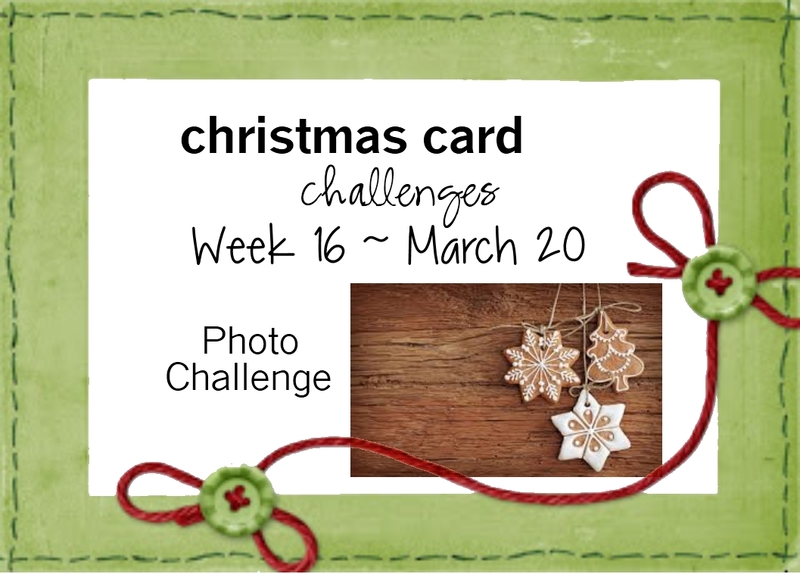 Photo Challenge ~ Kraft and White (ornaments). Although the only real requirement is that you make a Christmas Card. I had SO much fun creating this card. I wanted to make a tri-shutter card this week ... 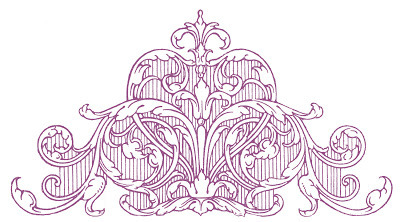 BUT I wanted to use 5-1/2" x 11" cardstock and not the typical 5-1/2" x 12" piece. I have a lot of 8-1/2" x 11" cardstock and would rather use that size up rather than cut into my 12" x 12" cardstock. So, I tweaked the pattern and came up with a finished card that measures 5-1/2" x 4" and fits nicely into an A2 envelope. The card base is Kraft Cardstock. I stamped the wood pattern (SU!) onto Natural cardstock using Crumb Cake ink (SU!) and trimmed it to fit the front panel. The inside was decorated with DSP from The Linen Closet Stack (DCWV). I tried out additional die-cuts, embellishments, ribbons, etc. to fancy up the card, but decided in the end that less was the best look for this card. The sentiment is a "no name" stamp I've had for ages. The ornaments and snowflake are from Memory box glued to kraft cardstock (which was fussy cut to create a "shadow"). I added twine to the front ornaments...well, because there was twine in the Inspiration Photo. Now, for the pattern. 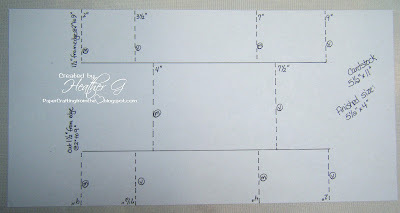 Begin with cardstock cut to 5-1/2 x 11 inches. I found it easier to cut my inside lines first, then score so I would know where to stop and start my score lines. Each cut line will be 1-1/2" from the long edge ~ you'll cut from 2" to 9". Then, score from the top to the first cut line at 2", 3-1/2", 7" and 9". Score between the 2 cut lines at 4" and 7-1/2". 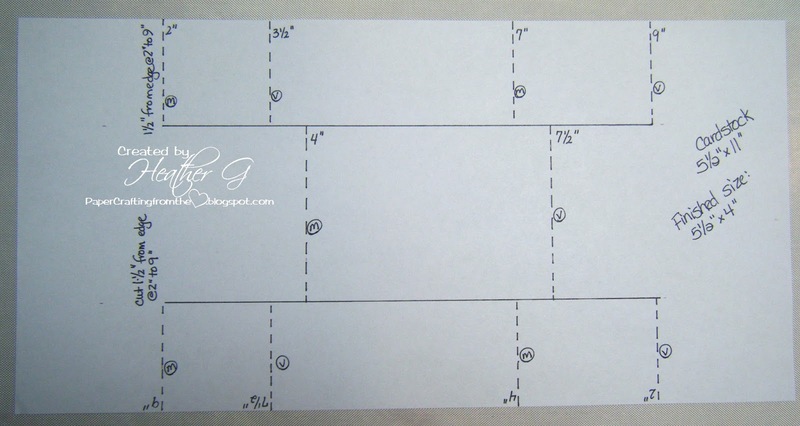 I then found it easier to rotate my cardstock and score from the top to the cut line at 2", 4", 7-1/2" and 9". Yes, the score lines may seem a bit wonky, but it works in the end. Refer to the picture below and hopefully this will clear up any confusion. I've marked the Mountain and Valley folds on the pattern also. while the back of your card, when flipped over, will be 1/2" shy of matching the front ... so be sure you know which is the front and the back before you begin decorating your card. However, as you can see in the finished card above or especially once the card is opened, you can't tell the back is a bit short. 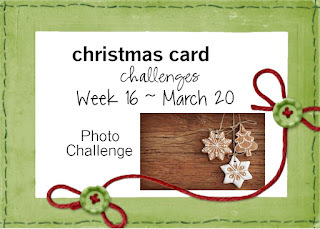 Please stop by the Christmas Card Challenges Blog to see what the other Design Team members have created this week. Then grab your kraft and white card making supplies, and join along. I can't wait to see what you create this week. Absolutely stunning Heather! I've made one of these once and I know they are a lot of work. Your card is amazing! What a great design and beautiful use of the neutral colours. Beautiful tri-shutter card Heather. Love your snowflake ornaments and pretty design of your card. MAGNIFICENT creation .In awe ! Thank you for sharing template information too .